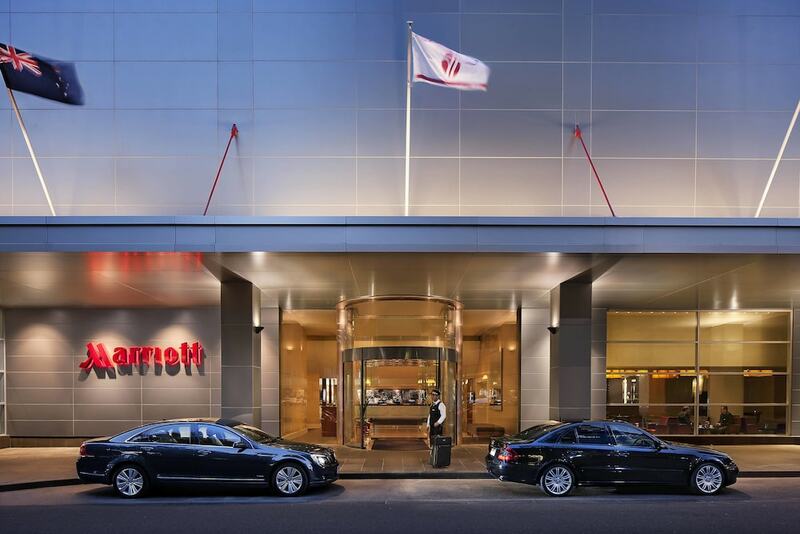 With a stay at Melbourne Marriott Hotel, you'll be centrally located in Melbourne, steps from Her Majesty's Theatre and 6 minutes by foot from Princess Theatre. This 5-star hotel is 0.4 mi (0.7 km) from Melbourne Central and 0.5 mi (0.8 km) from Bourke Street Mall. Make yourself at home in one of the 185 air-conditioned rooms featuring refrigerators and minibars. Your pillowtop bed comes with premium bedding. Wired and wireless Internet access is complimentary, while 42-inch LCD televisions with cable programming provide entertainment. Private bathrooms with showers feature complimentary toiletries and hair dryers. Take advantage of recreational opportunities offered, including an indoor pool, a spa tub, and a fitness center. Additional amenities at this hotel include complimentary wireless Internet access, concierge services, and wedding services. Enjoy a meal at the restaurant or snacks in the coffee shop/café. The hotel also offers 24-hour room service. Quench your thirst with your favorite drink at the bar/lounge. Buffet breakfasts are available daily from 6:30 AM to 10:30 AM for a fee. Featured amenities include a business center, limo/town car service, and express check-in. Planning an event in Melbourne? This hotel has facilities measuring 4489 square feet (417 square meters), including a conference center. Marriott Melbourne features an indoor/outdoor pool with a spa tub. The indoor portion is enclosed by a glass atrium. A modern fitness center is also on site. Dining-and-refreshment options include the Essence restaurant, the Country Bred on Lonsdale coffee house, and the Elements Bar. Room service is offered 24 hours a day. The hotel has a conference center, 6 meeting rooms, and a full-service business center. Wireless Internet access is provided in public areas. A concierge team is available to assist guests 24 hours a day. A security guard is on-site. Secure parking is available for a surcharge (parking height restrictions apply). This Melbourne hotel is a smoke-free property. Essence Restaurant - Modern Australian cuisine featuring local beef, seafood, and seasonal produce. Open-plan kitchen. Floor-to-ceiling windows with street views. Menu sample (subject to change): Seafood Bouillabaisse, Seafood Stack for Two, Three-Onion Risotto, Gippsland Beef Tenderloin. Breakfast, lunch, dinner daily. Country Bred on Lonsdale - Gourmet sandwich bar with a contemporary twist. Renowned high tea service. On-site coffee house open daily for breakfast, lunch, and dinner. Specialty coffee drinks, teas, and snacks. Elements Bar - Lounge with cocktails, premium Australian wines, and Australian and international beers. Breakfast, lunch, dinner. Open morning till late night.